Looking for a landscape company to provide weekly, bi-weekly, monthly or annual landscape maintenance in Salt Lake City & surrounding areas for your business? Look no further, Ridgeline Landscaping in Salt Lake City provides commercial owners, of both small and large businesses, landscaping maintenance in Salt Lake City. 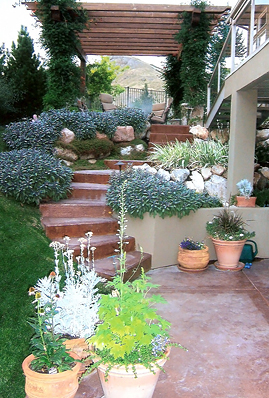 Having an experienced local Salt Lake City landscape company such as Ridgeline Landscaping maintain your business landscape will not only improve the value of your property but will also attract new and return customers. If affordability is what your looking for, in this rough economy, you will find Ridgeline Landscaping is the company you want working for you and your business. Not only does Ridgeline Landscaping provide customers with landscape maintenance in Salt Lake City, but also provides a sharp looking Salt Lake landscape. You will find creativity and uniqueness, leaving your customers talking about your landscaping. You will find many businesses around who use Ridgeline Landscaping in Salt Lake City for all of their Salt Lake City landscape maintenance needs. You can rest assured you are in good hands, there is no job too small or too large for Ridgeline Landscaping to maintain.